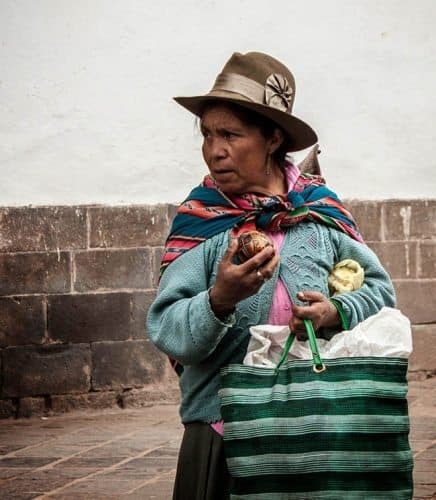 This vendor is from Chincherro, a traditional Andean town outside of Cuzco with breathtaking views of the mountains and Incan ruins. She sells handmade hollow gourds during the week and returns home every evening. Comfortably crammed into seat number 17, I was grateful to be next to the window at the very least. 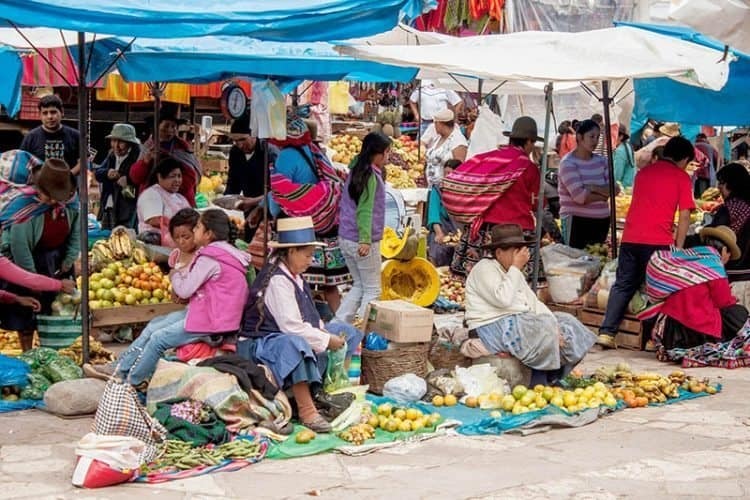 I settled in for the hour long bus ride from Cuzco, Peru to the famous town of Pisac, which is renown for its Sunday market - filled with fresh produce and handcrafted goods. My seat-mate was a middle-aged Quechua woman from the indigenous population of Peru. She was sitting with her five-year old son on her lap, who entertained himself with the essentials: sleeping, hugging his mother, eating sweet bread, and staring unabashedly at me. Each turn up the winding road from Cuzco revealed a bird’s eye view of a labyrinth of courtyards and markets enclosed behind thick adobe walls—members only, in other words. The further we ventured from the city, the more locals we picked up—Quechuas returning to their villages after a busy morning at the Cuzco markets. The bus abruptly pulled off at a nonexistent shoulder, packing more people onto the already crammed bus. At this point it was standing room only, and I was grateful that I had bought a ticket for one of the few prized seats. Teenage boys with mountain bikes were hitching a ride up into the mountains in order to propel themselves recklessly down the mountainside. Each sported an impressive array of cuts and bruises. Regardless, they disappeared down the sheer face of the mountain with a mischievous sparkle in their eyes as we left them to climb further into the hills. The woman beside me began to befriend me; as we conversed, I learned of her eagerness to marry me to one of her two sons. I politely declined the offer, but she did not seem put-off. Rather, her laughter filled the bus as she called me out on playing hard to get. Her kindness was infectious, and she pointed out her village up in the hills amidst the scattered ruins as we arrived in Pisac. 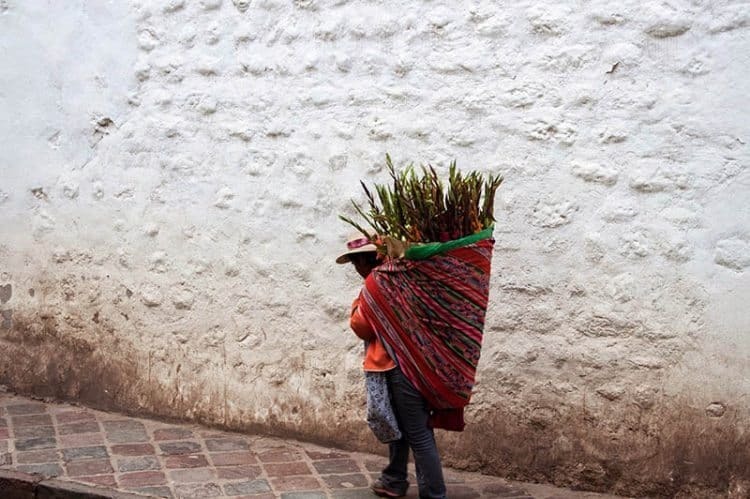 A Quechua woman walks to the main plaza in Cuzco to sell flowers from her village. She uses a carrying cloth to transport her goods. Each town and market has a heartbeat of its own that changes with the time of day and season. Arriving to the Pisac market in the afternoon revealed an atmosphere in a satisfied lull. The major tourist crowds of the morning had already dispersed and most of the clothing vendors appeared more interested in eating lunch and socializing than in selling their goods. Endless rows of Alpaca sweaters, hand-woven tapestries, and beautiful jewelry create a network of tarp-covered pathways one could get lost in for hours. The hush of the cool cobblestone invites you to meander your way through the market at leisure. In the town’s main courtyard the produce vendors who are all women sit amongst their goods like queens of the palace. I bought a deliciously juicy peach from one of the toughest women I’ve ever laid eyes on. The butcher stood stoically behind her counter of piled up dead chicken brandishing two long knives together in a manner so monotonous it seemed maniacal. Around the outskirts of the plaza, prepared food vendors showed off an array of enticingly unidentifiable dishes that smelled entirely irresistible. Among them, women who walked around with plastic painter’s buckets filled with homemade food. 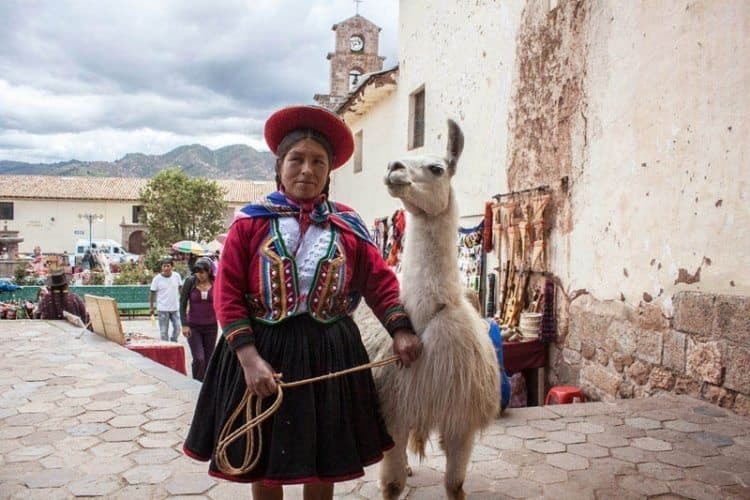 Pisac is a traditional market town in the Sacred Valley about an hour outside of Cuzco. Sunday is the biggest day for the market and is a popular tourist destination. They scooped out a reasonable portion onto real plates with sliver cutlery, or dropped it into a bag for those who want to eat on the go. I saw that one of the women had a bucket filled with potatoes, the papa—which is the national staple of Peru. Pisac is a traditional market town in the Sacred Valley about an hour outside of Cuzco. Sunday is the biggest day for the market and is a popular tourist destination. However, the combination of my poor Spanish and her poor Spanish (her first language being the indigenous language) combined with her innate feistiness, led to a crowd of local women coming over to haggle my order. After a long debate as to whether she sold potatoes or not, she scooped out a delicious smelling mash of some sort of onion and cilantro dish - and proceeded to add three potatoes as an afterthought. Handing over two soles (the monetery unit in Peru), I took my delicious “meal in a bag” with me to explore the rest of the town before catching one of the many unofficial buses back to Cuzco. The hour long bus ride back turned into two, but the views of deep valleys and rolling hills at dusk kept me longing for just a bit longer. My seat on the ride back to Cuzco was a farmer’s bag of onions behind the driver’s seat. Needless to say, there’s a bit of surprise around every corner in Peru; whether it's a marriage proposal or an oncoming bus on the wrong side of the road. With the willingness to adapt, comes endless adventure- in the form of a seat on a bus, or a bag of onions. Danielle Balderas is a photographer and writer exploring the connection between people, their culture, and the spaces they inhabit.